​A sunny day, a gorgeous setting – it's the perfect excuse to pack up some tasty snacks and roll out a rug. Who doesn't love a picnic? Whether it's a spur-of-the-moment makeshift picnic or an alfresco date you've been planning for weeks, Wine Country ticks all the open-air dining boxes. Amazing views – tick. Pristine picnic sites – tick. Local food and wine – tick, tick tick. There are plenty of providores and dairies where you can choose your picnic ingredients and some also sell pre-packaged hampers if you want to do it the easy way. So what makes a good picnic? You'll need some essentials like an Esky or chill bag, plates, cutlery and glassware, tasty snacks that are easy to transport and a selection of summery beverages. And there's no need to pack a bottle opener nowadays as most Hunter Valley wines are under screwcap. 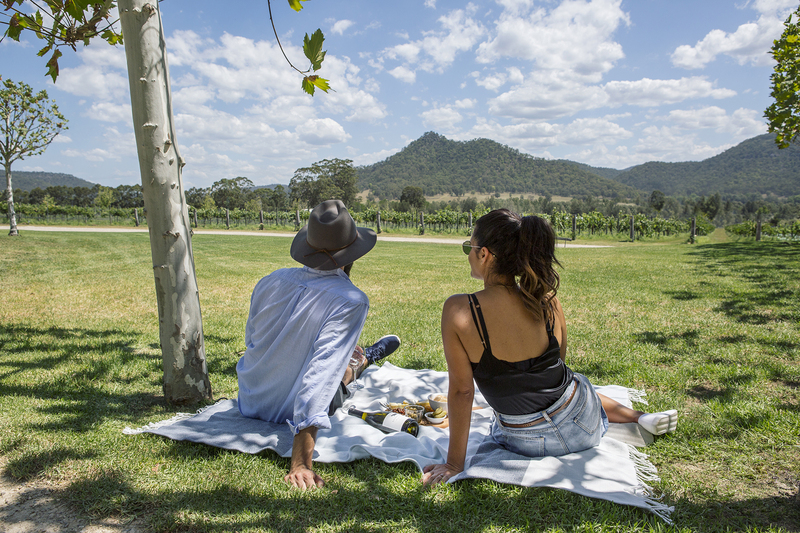 Once you've worked out where you're going to spread out your chequered blanket (see our list of BBQ and picnic spots in vineyards here) it's up to you how much you upgrade your picnic. A linen tablecloth, plush pillows, folding chairs or bean bags can really glam up your picnic setup. Whatever your style, filling your basket with local food and vino is super easy. ​ Start with Binnorie Dairy – the soft-cheese specialist in Lovedale. Owner Simon Gough sources his milk from a range of local dairy farms to make his handcrafted artisan cheese. He opened his first Hunter dairy in 2003 and moved to the new purpose-built dairy and cafe last year, where you can have a free cheese tasting before buying your picnic supplies. Everything from marinated feta (his flagship cheese), a creamy labna (a yoghurt cheese from cow's milk) to chevre with dill (a goats' milk curd). There's a range of yummy salamis made inhouse too – one taste of the delicious duck salami and you'll be hooked. There are also shelves stocked with olive oils and pantry items, with cooler bags and ice for sale. ​ This popular food emporium has two outlets in the Valley. There's a refrigerated cheese room filled to the brim with cheeses from all around the world, including local Binnorie and Smelly's own brand. Fancy a Swiss Appenzeller – one of Switzerland's oldest cheeses? You'll find it here… along with French Roquefort, Italian pecorino and Spanish manchego. They stock everything you need, from freshly baked bread, housemade chutneys and preserves, olive oils, quince paste and crackers as well as timber cheese boards to serve your spread on. You can choose individual items or pick up one of their pre-packed hampers. ​ If your picnic fantasy includes reclining on a rug being hand-fed grapes, you've come to the right place. Three generations of the Tinkler family have worked their farm since it was established in 1948 and they sell their homegrown, hand-picked fruit and veg at the cellar door. What's in season this month? Big juicy tomatoes, apple cucumbers, melons, fresh figs and 14 varieties of table grapes, which you can pick yourself between 9am and 10.45am if you're after some hands-on outdoor activity. ​Pukara's extra virgin olive oils (EVOOs) are sought after for their quality and flavour – and they're sustainably grown in their grove in Muswellbrook with everything produced and packaged on site. They have EVOOs with lemon, chilli, wasabi, truffle, garlic and lime, as well as vinegars and condiments including some interesting flavoured smoked salt flakes, which you can taste in their Pokolbin tasting room. For a smashing picnic starter, just add a bit of bread to their EVOO, caramelised balsamic vinegar and cashew and roast onion dukkah. ​This Hunter institution has everything you need for your picnic spread. It has been making and selling award-winning cheeses and regional produce for more than 20 years. There are around 12 cheese varieties made on site, depending on the seasonal milk quantity, which they source from several dairy farms around the Valley. The Branxton Brie, Hunter Valley Marinated Feta and Pokolbin Smear-Ripened are particular favourites. There's an entire wall of refrigerated cheeses and packaged meats in the front room, and in the back room there are lots of other gourmet goodies, including oils, house-marinated olives, tapenades, chutneys, marmalades – which you can taste too. You can also buy a polystyrene hamper box with an ice brick, as well as disposable cups, plates and cutlery packs. ​Want to ensure your romantic picnic is smoking hot? Then add some smoked meat and fish to your feast. Owner/chef Ben Sales makes traditional cold smoked salmon, rainbow trout and duck but why not be a little daring and try smoked kangaroo or octopus? He also produces pates, terrines and a huge range of smoked salami and cheeses – sold exclusively at the smokehouse. The pantry also stocks a range of other deli items too, with Thermabags and ice available. ​ This is a temporary location for Two Fat Blokes while they build a new cafe and deli. Head through the cafe to the deli section out back where there's a tasty selection of cheeses and smallgoods you'd be happy to see packed in the picnic basket. Packaged salami, chorizo and other meats are the perfect size for a picnic, and there's a cabinet stocked with oils, condiments, bark (the edible kind) and dressings – if you don't want to make your Caesar dressing from scratch you can pick one up here. Choose your own snacks or grab a pre-packaged antipasto, cheese or picnic hamper, which are packed in a cooler bag. .Another top tasting spot offering delicious Australian olive products that cover all the bases – flavoured olive oils and vinegars, as well as table olives and tapenades. Steve and Racquel Goodchild are sixth generation farmers based in the Upper Hunter Valley who opened a retail shop in the Ben Ean winery in the heart of Pokolbin in 2017. Head into the cellar door, turn right and head upstairs to the bright airy shop for a taste. The herb and garlic olive oil is a real crowd-pleaser. For easy entertaining outdoors, drizzle it over sweet tomatoes, bocconcini and basil. Of course, you'll need some wine for your picnic and if you want to kill two birds with one stone, there are several cellar doors that offer olives, oils and chutneys as a sideline to their wines, including Adina, Tintilla and Whispering Brook. And if you feel that no picnic would be complete without chocolate, head to Cocoa Nib or the Hunter Valley Chocolate Company for some scrumptious sweet treats. Bon appetit.